HomeManaging email communications: Winning the battle … losing the war? Managing email communications: Winning the battle … losing the war? Here’s a statistic that won’t come as a big surprise to many office workers … but it still looks pretty stark when you see it on the page: According to research by McKinsey Global Institute, knowledge workers, including managers and professionals, spend nearly 30% of their work time managing e-mail communications. 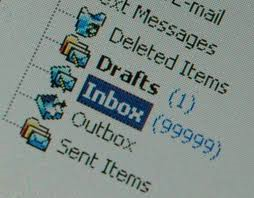 This means that for a typical 50-hour work week, a total of 15 hours are sucked up in the e-mail vortex. It’s nothing new, of course. And for years, companies and individuals have been making efforts in big and small ways to manage their e-mail. One method has been through the use of IM social collaboration platforms, but that solves only some of the problem. Other methods include aggressive pruning of spam mail … sending unsubscribe notices … and tightening incoming mail filters. Being more aggressive with e-mail unsubscribe requests can lighten the inbox, but other pruning efforts can sometimes be counterproductive, with “good” e-mails getting sent to junk e-mail folders, thereby requiring workers to scan those inboxes every day as well. Another popular e-mail management technique can work at cross-purposes, too. 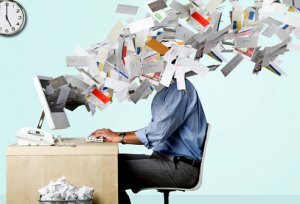 Research by Carnegie Mellon Institute has found that about a third of office workers file their e-mail messages into folders right after they’ve been read. But according to Alex Moore, who heads up e-mail management service Baydin, Inc. creating files associated with different clients, projects or people turns out to have its own inefficiencies when searching for e-mail messages later. It seems counterintuitive, but searching for older e-mail correspondence is often easier to do when using a single chronological file coupled with a search function, because it’s just one search instead of potentially many. 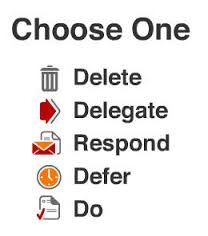 Adopting these practices makes it easier for me to concentrate on my other work tasks, keeping those Job 1 and relegating e-mail management to being “ornaments on the tree” rather than the tree itself. If other readers use particular e-mail management techniques and tactics that are effective for them, let’s hear about them. Please share your thoughts below. 1. I agree, it is much more efficient to keep e-mail in a single Inbox and search for it there, instead of filing it away in separate folders. Eventually I have to archive my e-mail, though, because I retain all incoming and outgoing messages instead of deleting them. My personal preference is to archive e-mail just once a year, during the slow period right after New Year’s Day, which keeps housekeeping chores to a minimum and helps me keep track of things by year. My e-mail archive goes back over 14 years and it’s still relatively straightforward to search that far back. 3. Instead of mindlessly hitting “Reply All,” I’ve found that taking a moment to remove all but essential recipients before sending each message pays big dividends. Not only does it cut down unnecessary outbound e-mail, it also reduces the number of replies coming back to me from recipients who are too lazy to learn this discipline! 4. I’m learning (but haven’t yet mastered) the discipline of reading e-mail in reverse chronological order. When batch-processing e-mail, this technique automatically allows me to ignore obsolete messages, because I’ve already read what I need to know by the time I get to them (for example, when someone sends a second message to correct or update an earlier one). 5. I don’t waste any time unsubscribing from spam, because I’ve found that anti-spam filters have gotten really good these days. However, I’ve also found that filtering quality varies widely between e-mail service providers. Our current service provider performs so well, I never have to check if good messages are straying into my Junk mailbox anymore. Just to be sure, I simply glance at the Junk mailbox about once a week (and never find anything). These are great insights, along with some good suggestions for techniques and tools. Thanks for sharing them!